Hello, today is a great day! The struggle has passed or at least I’ve broken through it. I had a feeling I would be here, when I came to understand my struggle last week. On Friday I wrote about how I realized that surrendering once isn’t enough, instead you have to surrender each day. I also wrote about how I wanted to meet someone who has mastered the art of surrendering daily. I wanted to meet that person so I could learn from their wisdom to help me surrender with ease. I will meet the person who is capable of surrendering daily. This person doesn’t exist somewhere out there, instead that person exists within me. 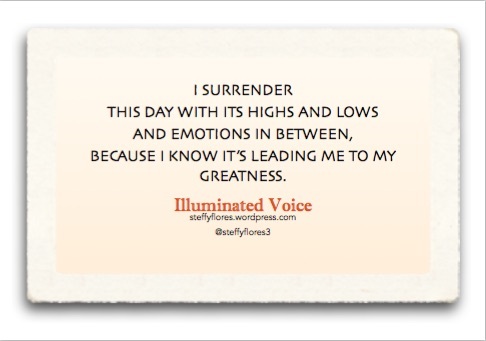 I will only meet this aspect of myself when I have mastered the art of daily surrender. To help me with the new found goal, I created a mantra. Today’s mindful Monday will be the first mantra of this blog. Happy Monday. Have you surrendered today?